The second one is captioned with a Fail,cat assembly, Dang Ikea instructions anyway. loved it. I don't care for cats but this is funny. Purron - thought you might have use for one of those as an avatar... Our Miss Tuna cat is busy napping today after spending all night sleeping. she found a gap in the baseboard by the dishwasher and is able to nap in one of the lower corner kitchen cabinets. We aren't using it, so we've tossed a towel in as a nap mat. I'm reminded of the scene in A Christmas story where the little brother hides in the kitchen cabinet - we open the door, ask if she wants her dinner there, close door. She comes out the door when she's ready. Thanks for posting this! The photos are wonderful and reaffirm why I love cats! The one sleeping on the clothes in the closet inbetween the hangers is priceless! And of course, the black and white cats nestling together with their tales in a heart shape would make a great V Day card. I don't care for cats. Purron, is your cat Siamese? I have a Siamese with very similar color. She and our dog like to sleep next to each other. We've never had cats and dogs who do this before. Historical Cats from the US Naval Institute Some interesting cat pictures as well as a few d*gs. 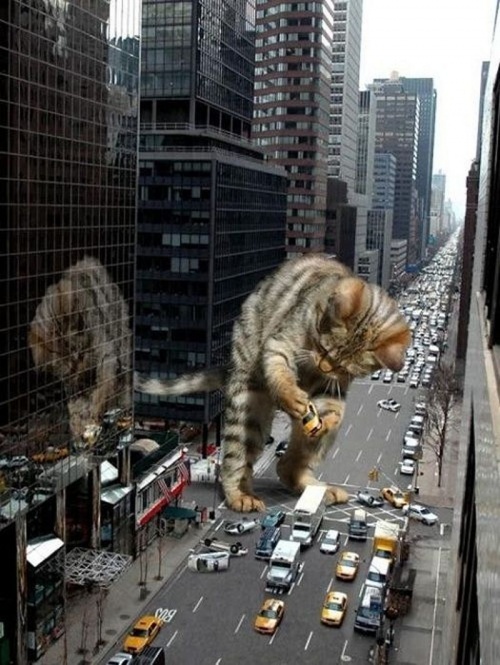 Awesome--I shared with my sister, another kitty freak! Yup. Eddie's a "Meezer" - slang for Siamese in rescue circles - but far from a purebred. He came from a shelter in a very poor, rural area. His mom and siblings were tabbies, calicos and tuxedos. Still a mystery how Eddie appeared in this feline family. He's been with us for 7 years now. Eddie is very smart but terrified of thunderstorms. We can tell if bad weather's coming because he runs and hides under the covers long before the weather hits. It's really quite amazing. He's a dear little fella and we adore him. Here are some more pictures of him. What a beautiful cat! And, my impression from the third picture is that he knows he's handsome. YouTube - A cat has fun with a dolphine ! Awe how cute is that. A serious candidate for cuteoverload.com. Purron, Eddie's gorgeous! I've had Siamese cats all my life. Some were rescues like your Eddie, some have been pureblood. Molly, my current one, I got from a vet and she's pureblood. Since we had 3 rescued dogs and 1 rescued cat at the time, I didn't feel guilty buying one pet. NW Landlady- that's the cutest thing!!! This is their adoption picture, because Peaches still spends nearly all daylight hours under the bed so I haven't taken my own picture yet. 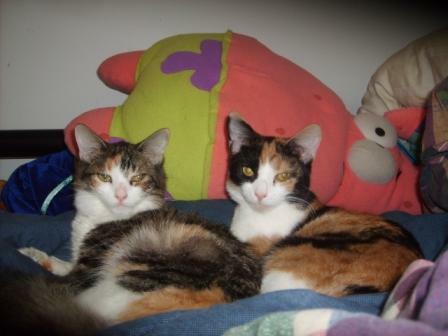 They were semi-feral and timid, but have great temperament. Pepper is already very friendly, and Peaches seems to be coming around slowly after 4 days. No hissing or scratching, litter trained, and quiet other than running around half the night. Soon I'll open up the rest of the house to them and hopefully they'll explore away from me while I sleep. Someone else was trying to adopt one of them, but when I said I'd take both they zipped through approval so that I could take them. They said for the first couple of days at the foster home that Peaches would hide and bury her head into Pepper.